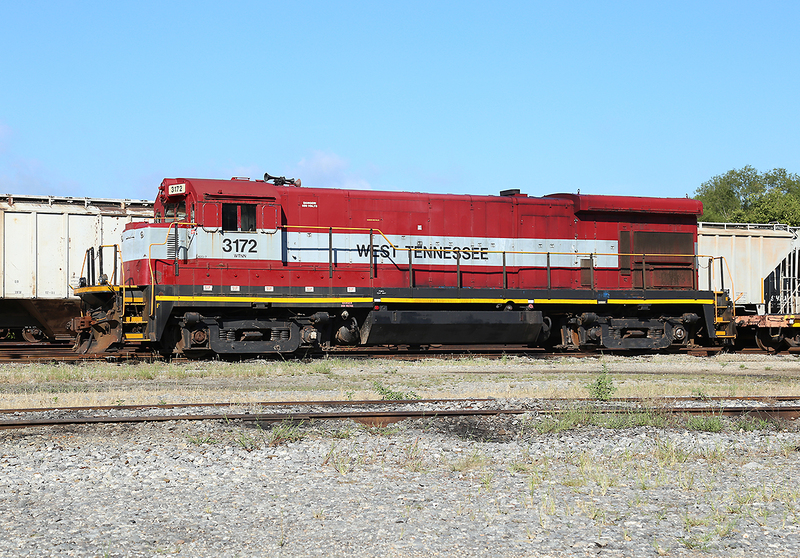 The West Tennessee Railroad had a unique appeal for me, in addition to operating a large portion of the former GM&O, one of my favorite fallen flag railroads, the line relies exclusively on GE motive power which I have always enjoyed photographing having grown up with CSX once large fleet of GE Dash 7’s. 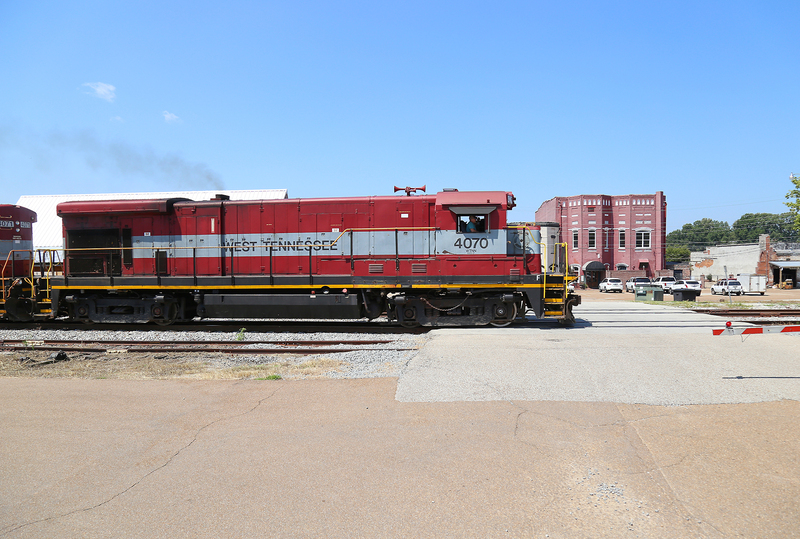 The WTNN is headquartered in Jackson, TN, a once thriving railroad town which at one time hosted the GM&O, Illinois Central and the NC&STL. 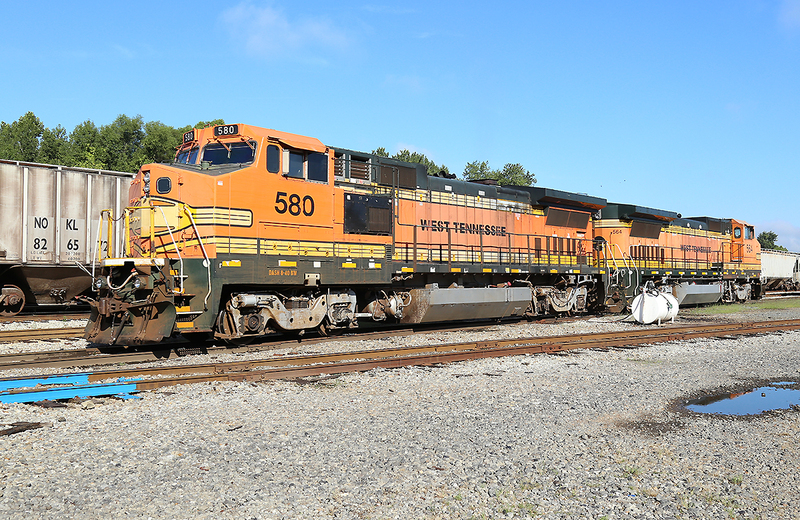 The GM&O had three lines out of Jackson, the first was once the former Mobile & Ohio’s main line from Mobile to St. Louis which reached Jackson from Mobile in 1851 and by 1882 connected Jackson to St. Louis. 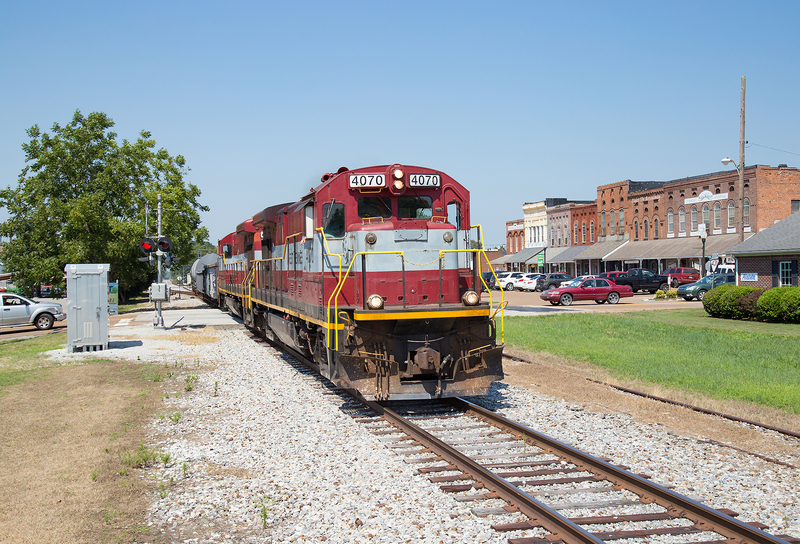 A predacesor to the Illinois Central reached Jackson from Fulton in 1857, the IC in 1905 negotiated for trackage rights over the M&O to Corinth where they constructed a new line to reach Birmingham, Alabama. 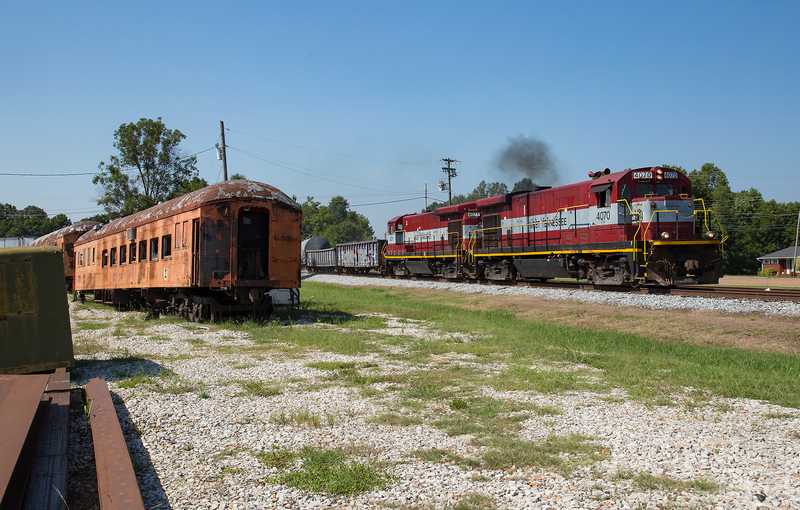 The final railroad to reach Jackson was the Gulf Mobile and Northern which reach Jackson from the South in 1917 later extending to Dyersburg, TN. 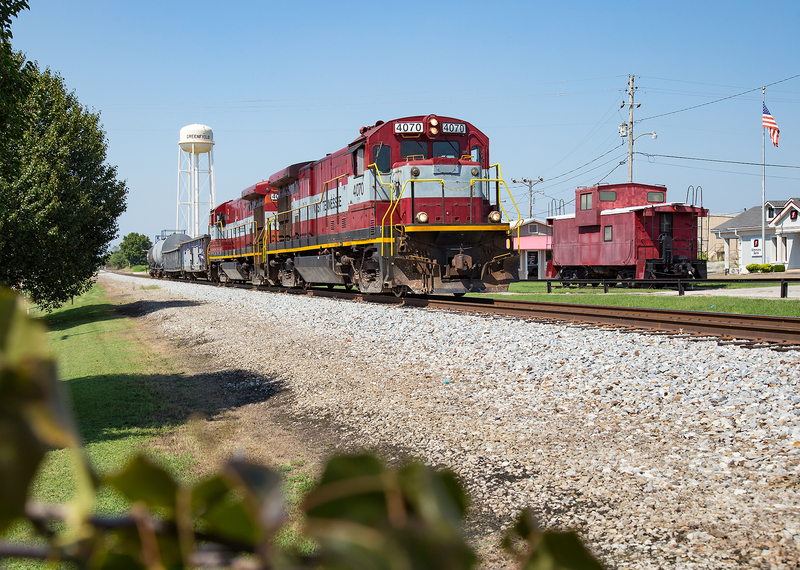 The GM&N and the M&O merged in 1938 in what many rail historians consider the beginning of the modern railroad merger movement, after the merger Jackson became the junction between GM&O’s east and west mainline which both rejoined in Mobile. The GM&O in turn merged with the Illinois Central in 1972 to form the Illinois Central Gulf, unfortunately this merger was the beginning of the a long downward spiral for Jacksons railroads as the ICG quickly shed much of the former GM&O trackage with both mainlines through Jackson becoming isolated segments. 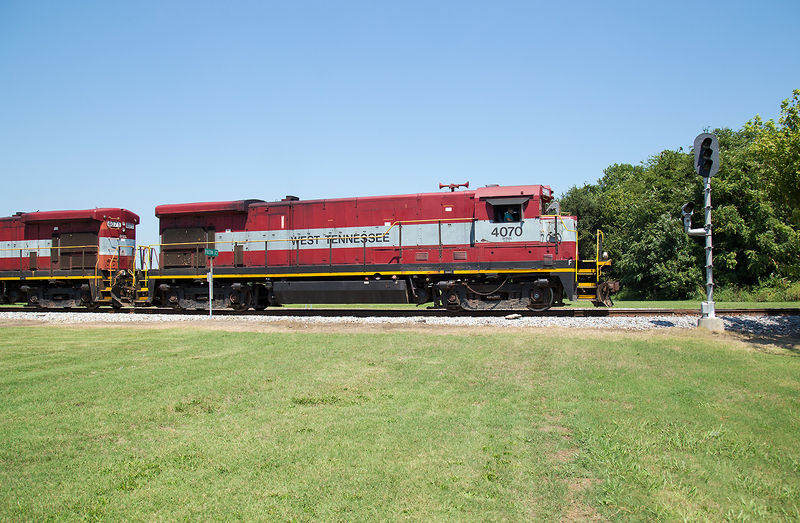 In 1984 the railroad sold the former GM&O mainline from Jackson to the end of track in Kenton to the newly formed West Tennessee railroad which began operation with a fleet of six axle ALCO locomotives. 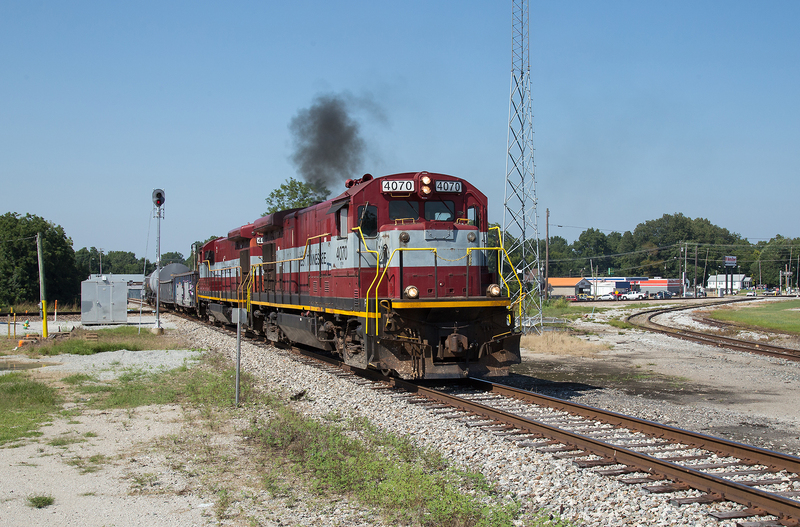 In 1988 the IC exited Jackson completely when it sold the former GM&O to Corinth and the IC to Fulton to Norfolk Southern in 1988 who planned to use it in conjunction with IC trackage rights in Centralia as a through route between Birmingham and St. Louis. Despite significant upgrades including installation of ABS signalling service problems on the IC led to NS discontinue use of the line as a through route with the former IC from Corinth to Birmingham abandoned entirely and the rest downgraded to local traffic only. 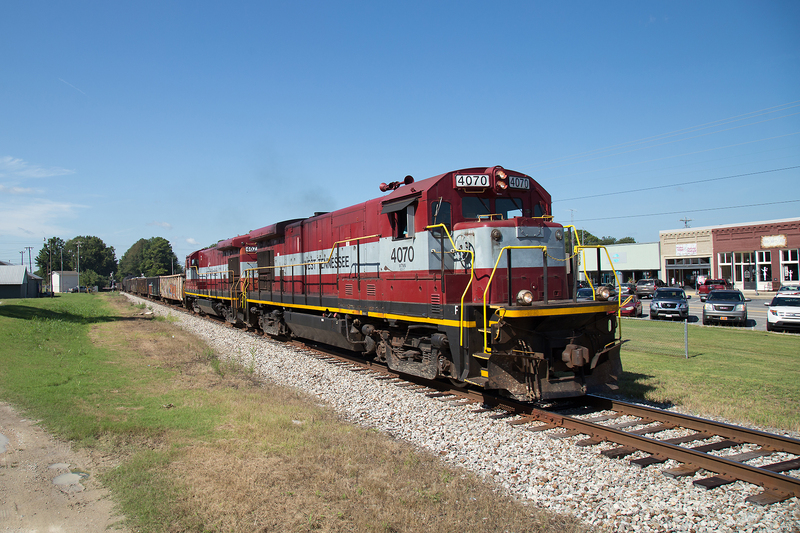 In 2001 NS leased the line to the West Tennessee which now operates the vast majority of trackage through Jackson. 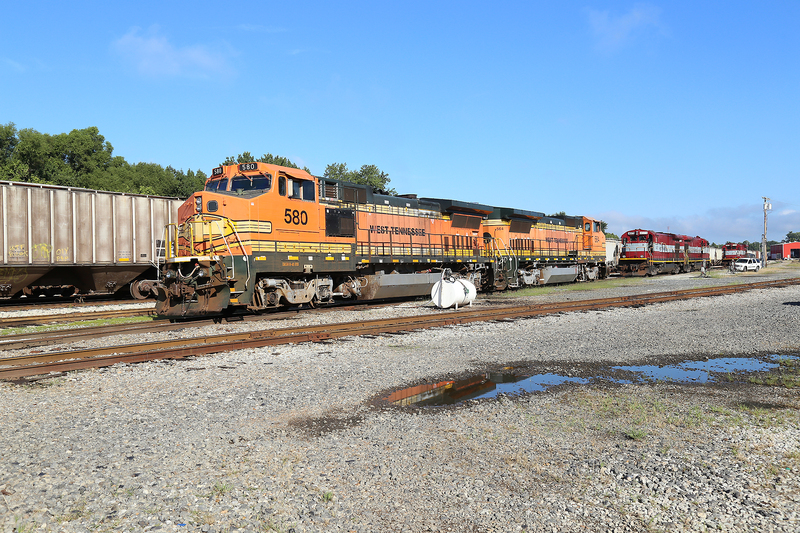 After starting with ALCO power the WTNN standardized on GE Dash 7’s, purchasing a large group of B23-7’s which were joined by a pair of C30-7s and two former BNSF B40-8W’s. The railroad still rosters two MLW M420’s but they rarely see service today. It starts the way most of my railfan trips do, in bed with minimal sleep and the alarm blaring at an ungodly early hour. After 40 minutes of snoozing the alarm I finally get up at 5:45 AM and get ready to make the long drive from the east side of Nashville to Jackson where one of the last bastions of GE Dash 7’s await. 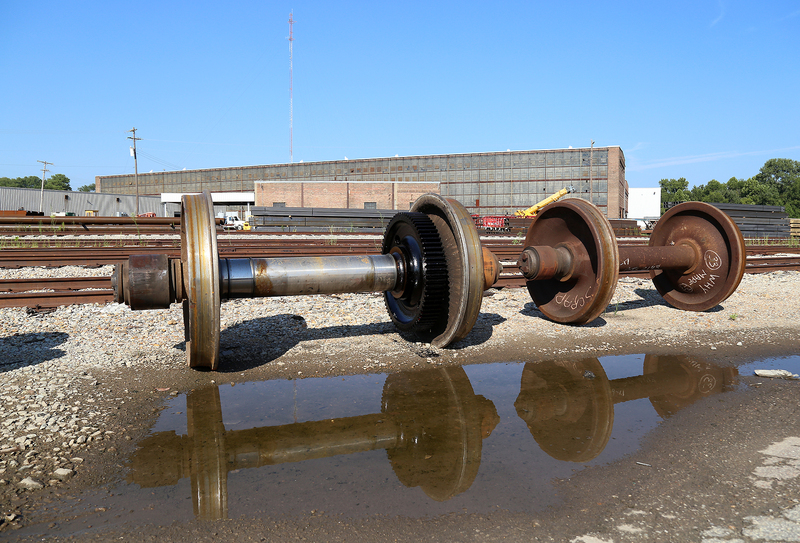 I am in Nashville with a friend of mine who serves on the board of the Nashville Steam Preservation society which is working to return NC&STL steam locomotive 576 to service. Since he had a board meeting in Nashville and I wanted to shoot the WTNN and the solar eclipse the following Monday a plan came together where I would drop him off at the meeting site then proceed to Jackson. We had driven through some heavy thunderstorm the night before and the skies over Nashville were still a mess of slowly dissipating clouds but the forecast was calling for pure sun in Jackson so I was optimistic as its not often one see’s that kind of forecast in the summer in the southeast. After dropping my friend off I headed out I-40 for the long and not particularly interesting drive down I-40 but I was able to make good time on the empty roads. I was running later than I wanted to but was hoping the WTNN would have a late start too. 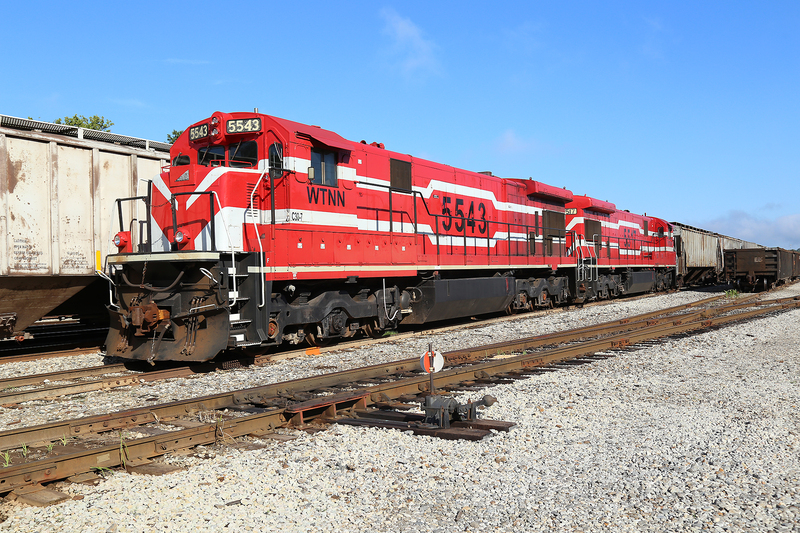 I was told the WTNN was a railfan friendly railroad and they most definitely were, a quick check into the office yielded the days info and permission to shoot whatever I liked as long as I stayed out of the way. 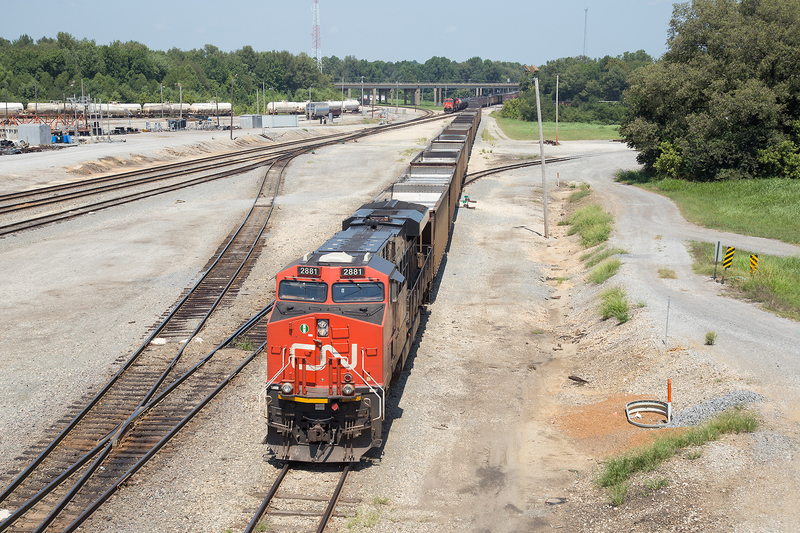 WTNN runs two daily trains, one of the CSX interchange in Humbolt and the other to the CN in Fulton. I had been told that the Humbolt job was gone but the Fulton train would still be departing but likely using the patched BNSF B40-8W’s. I was disappointed but on the other hand WTNN’s two beautifully painted C30-7’s were sitting in perfect light attached to a string of cars so that would definitely be worth a photo. A little further down the crew was cranking up the two B40-8W’s but also curiously enough the two B23-7s so instead of going to look for the Humbolt job immediately I stuck around to see what they would actually be using for power. My prayers were answered as they pulled the B40-8W’s out and immediately backed them onto an adjacent siding, the crew then got on the two B23-7’s and headed out to the south end of the yard to their train which had just been built by a yard crew, looks like I would have something good to chase afterall! 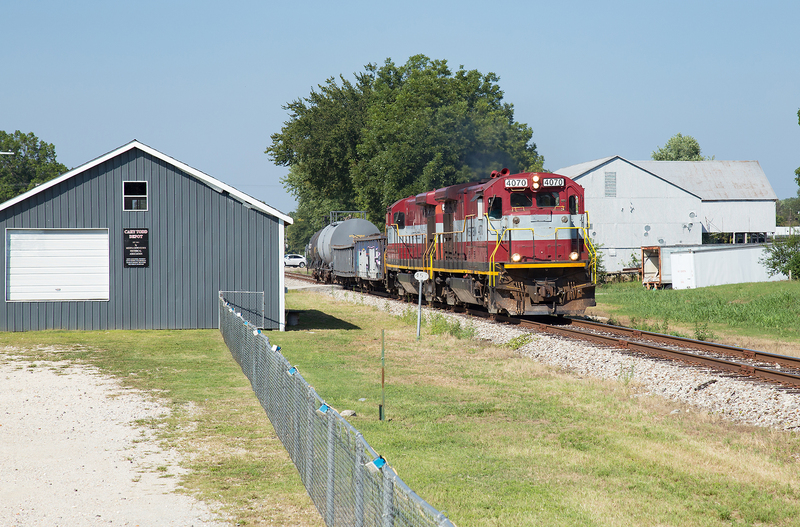 After watching them start to pull away to I headed north out of the yard to scout and found a spot on the Lane College campus where the line would curve east into the sun, the train wasted no time getting there and the chase was on! Click below for a video of the chase, not all spots included as the train sometimes got there before I could set up the video camera! I lost a bit of time getting out of Jackson and was not sure if I was ahead of the train, I decided to play it safe and head for the first town on the map, Medina where I could play the old game of ask random people if they had seen a train recently. 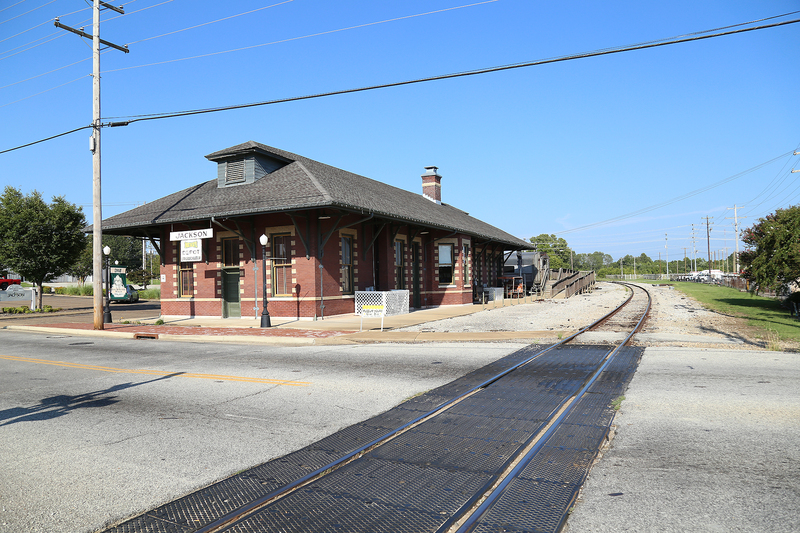 Interestingly there was a small depot like structure that was used for a farmers market, something I would see in several towns on the line and though the market was not set up a helpful woman inside confirmed that the train hadnt been by yet. I went to set up and soon enough there was the sound of a RS3L in the distance. The train blasted by at track speed which I believe is atleast 35 mph, one thing is for certain this is no slow 10 mph shortline! Interestingly just north of town at the appropriately named station of Ammo the train came to a stop to fly switch out a tankcar onto the Milan Ammunition plant spur, most likely for storage as from google maps it appears the entire facility is filled with stored cars. At Milan the line crosses CSX’s former L&N Memphis line at grade, though no interchange occurs here regularly CSX uses the connecting track on a regular basis to run via trackage rights to Jackson where they serve two large industrial parks on an isolated segment of the former NC&STL Memphis line which was otherwise abandoned between Hollow Rock Junction and Memphis. The diamond at Milan is the only one on the line still in place but the line to Fulton is littered with the remains of dead railroads that used to cross at grade. North of Fulton the sun angles grew increasingly worse as the high sun of midday set in, not helped by the fact the train was running due north. But no worries as that meant the southbound chase would be excellent and there would be plenty of time for scouting on the way north. The scenery is not remarkable but the line has a few small bridges and passes through a plethora of small towns, all with some interesting trackside structures that can be incorporated into the shot. 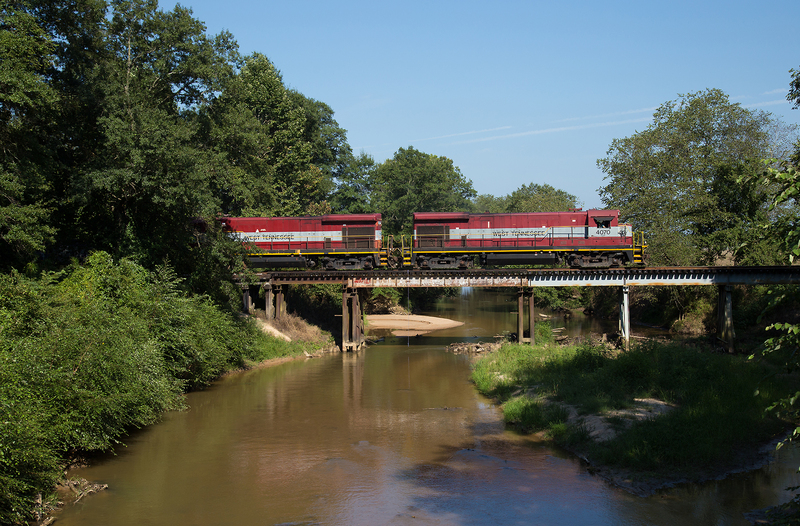 Crossing the Rutherford Fork Obion River south of Idlewild. Rolling north through the small town of Bradford, TN, the self proclaimed home of Doodle Soup, everyones got to have some claim to fame I guess. The reading of the severe weather threat is a welcome sign, this part of TN is prone to severe weather and on April 2nd 2006 an EF3 Tornado did extensive damage to the city with 6 deaths. After Bradford the line passed through a succession of 3 more towns; Greenfield, TN which featured a former GM&O wide vision caboose on display, Sharon, TN and finally Martin, TN which is home of the University of Tennessee Martin. 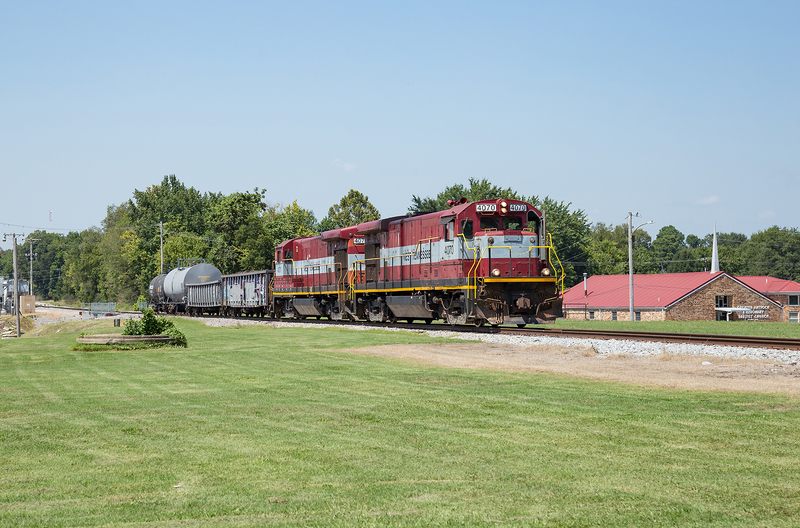 Martin was also where the old NC&STL line to Hickman, TN once crossed, today just a short segment to serve a few customers exists. After breaking off the chase at Martin I arrived to the CN yard in Fulton to find a empty coal train backing off the connecting track with the WTNN connecting track with a KCS motor on the north end and a CN ET44 on the rear, not having seen the whole process I can only assume it had come off the old IC main north of the Fulton that CN still owns. I had hoped to get the WTNN pulling into the yard under the bridge but after shooting the coal train depart I came to the unfortunate realization that they would be backing in instead so went to sample the fine dining of the nearby Wendy’s while the train was in the yard. 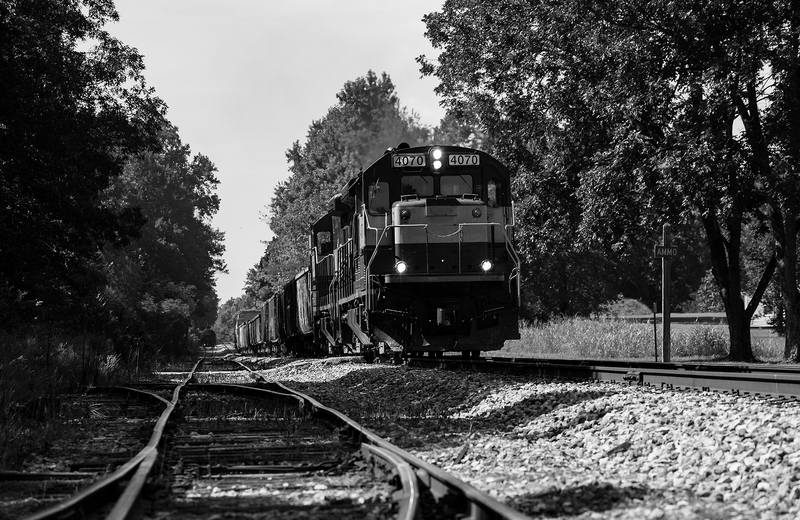 “The first line through Fulton was the New Orleans & Ohio Railroad. 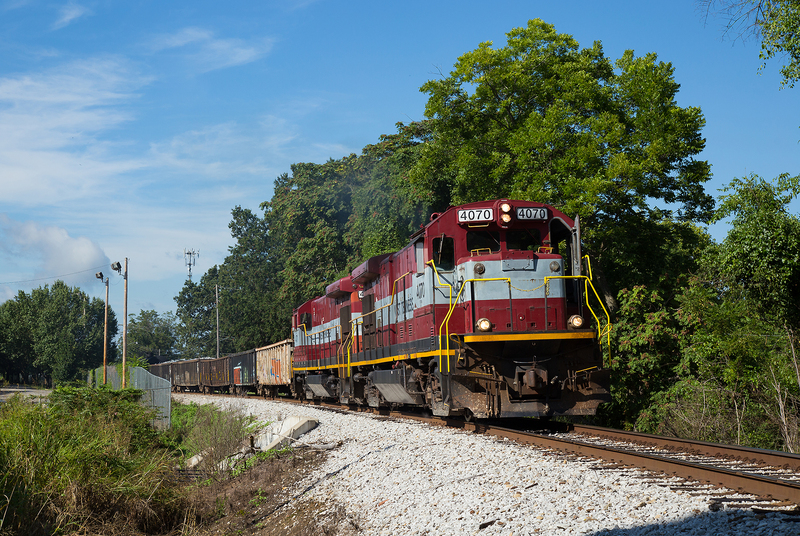 This line was chartered in 1852 to lay track from the Ohio River at Paducah, KY, south to New Orleans. 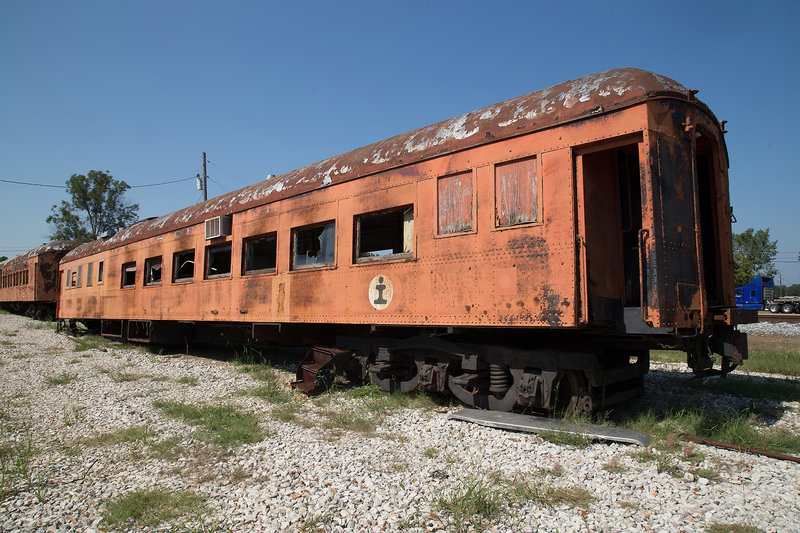 The line was underfunded and didn’t reach Mayfield, KY, until 1858. It finally reached Fulton sometime in late 1860/early 1861 (there are conflicting dates). After the war the railroad gave up its dream of building all the way to New Orleans and instead decided to settle on Memphis. However, the company went broke and was sold and resold several times and underwent several name changes. 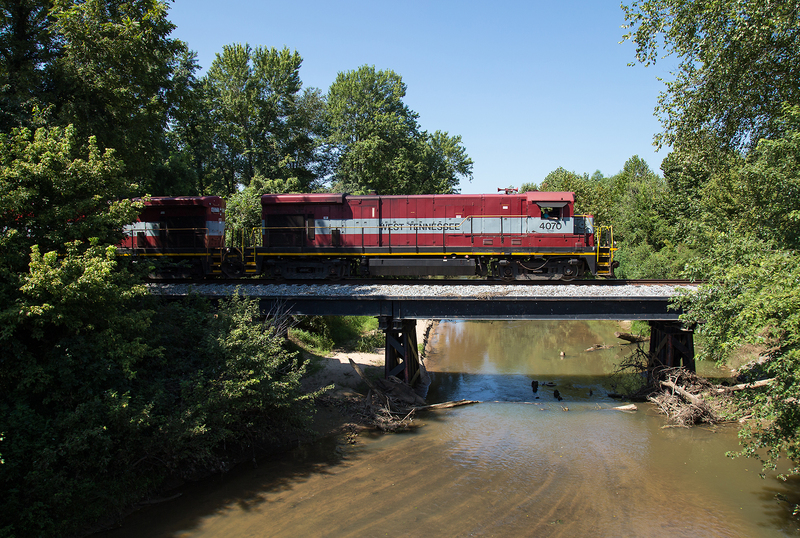 Finally in 1881 Collis Huntington (yes, THE Collis Huntington associated with Southern Pacific) formed the Chesapeake Ohio & Southwestern Railroad with the goal of completing the Fulton-Memphis line. 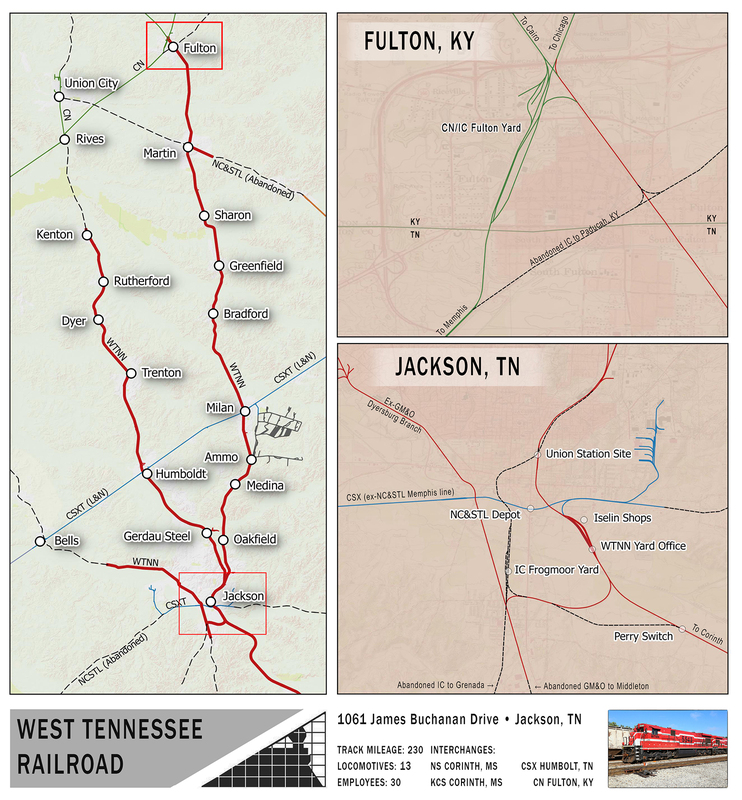 In 1882 the CO&SW drives the last spike in the Fulton-Memphis line. In 1893 the IC acquires control of the CO&SW, but doesn’t acquire full control until 1896. 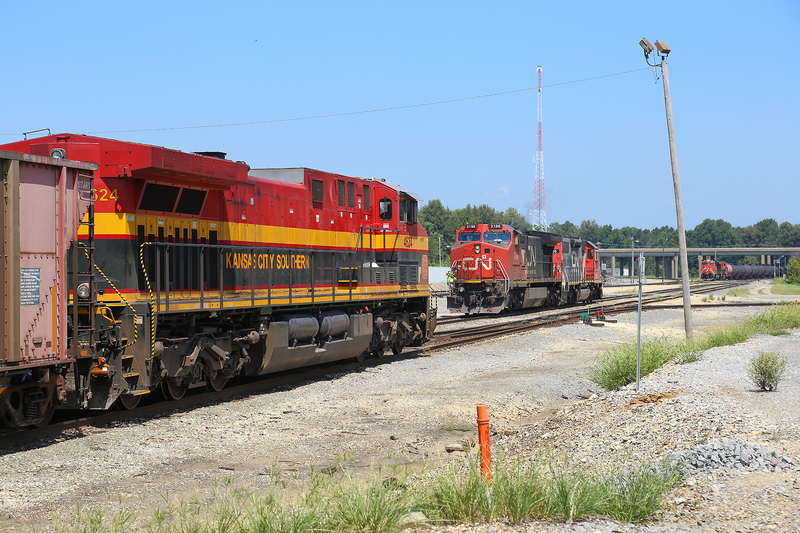 Afterwards IC upgrades the line from Fulton to Memphis and IC’s through trains (ie, from Chicago to New Orleans) are rerouted over this line and away from the line through Jackson, TN and Canton, MS (see next paragraph). 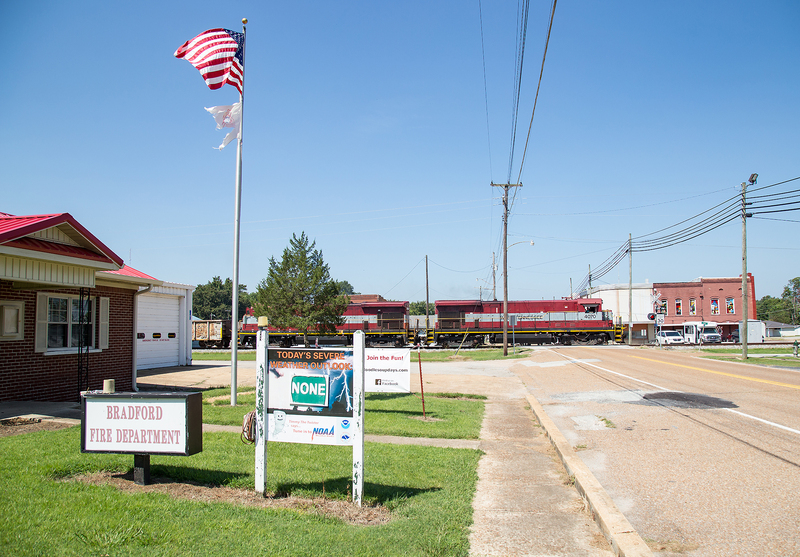 The second oldest line through Fulton is the Cairo District, completed in 1873 by the Mississippi Central. 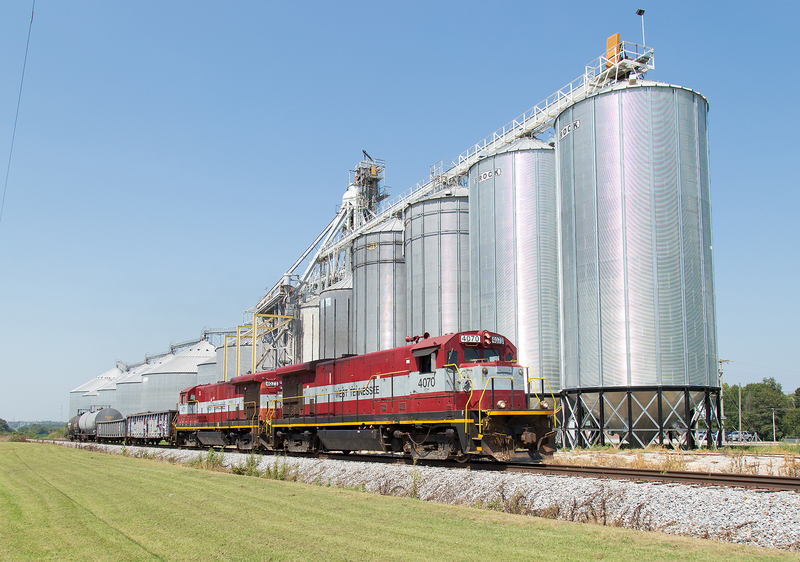 The IC helped finance construction of the MC from Jackson, TN, north to East Cairo. 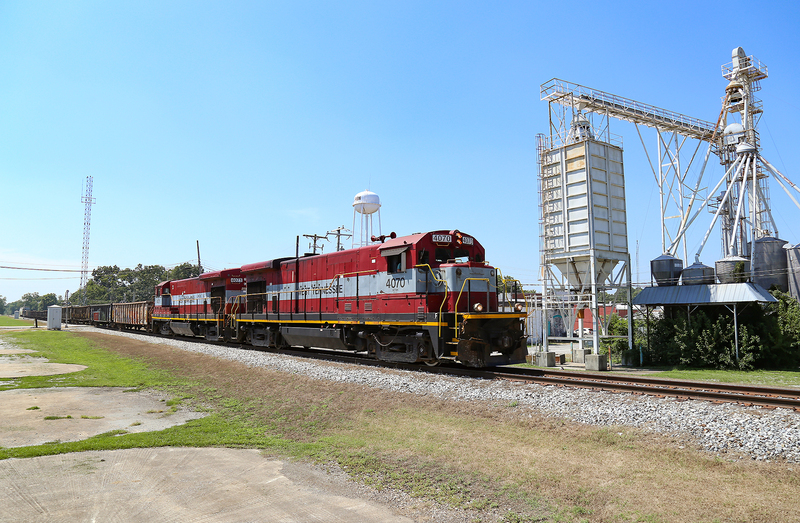 IC also loaned money to one of MC’s sister railroads further south to lay track and upgrade facilities. All this new construction gave the IC a route into New Olreans. 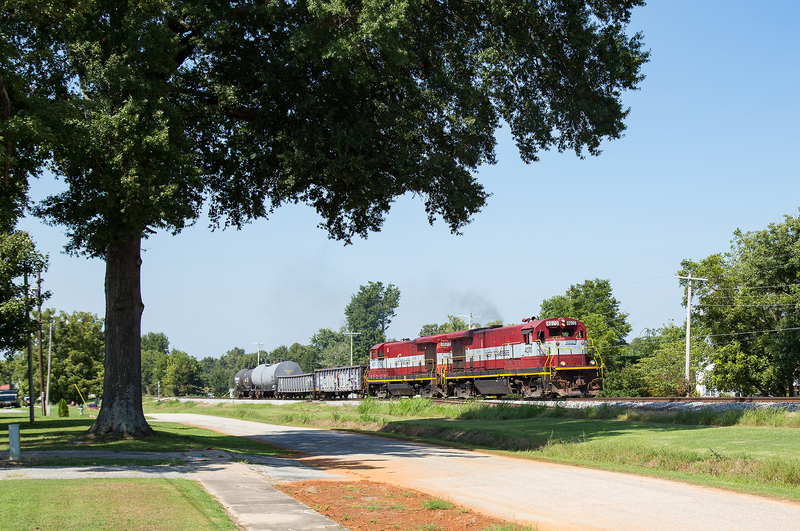 The two southern routes defaulted on their loan payments and IC wound up with the lines. 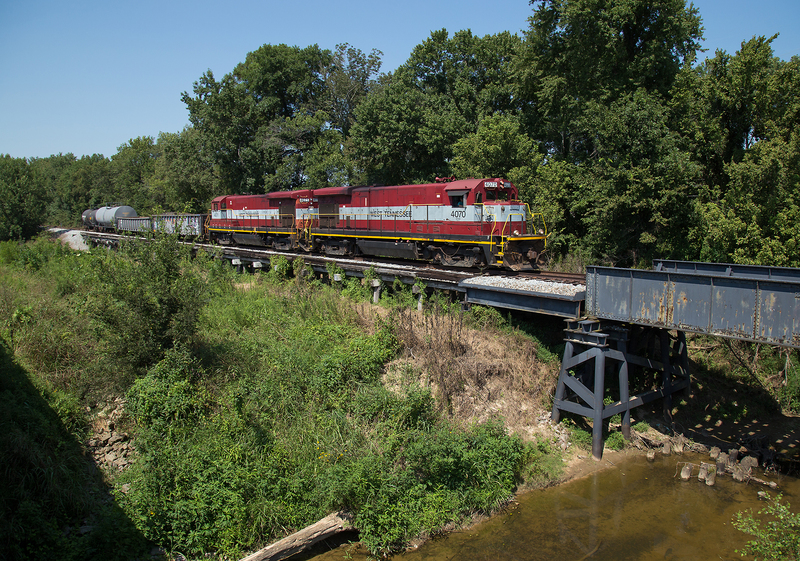 The last IC line built into Fulton was the Edgewood Cutoff, aka Bluford District, north to Bluford, IL, and Edgewood, IL. 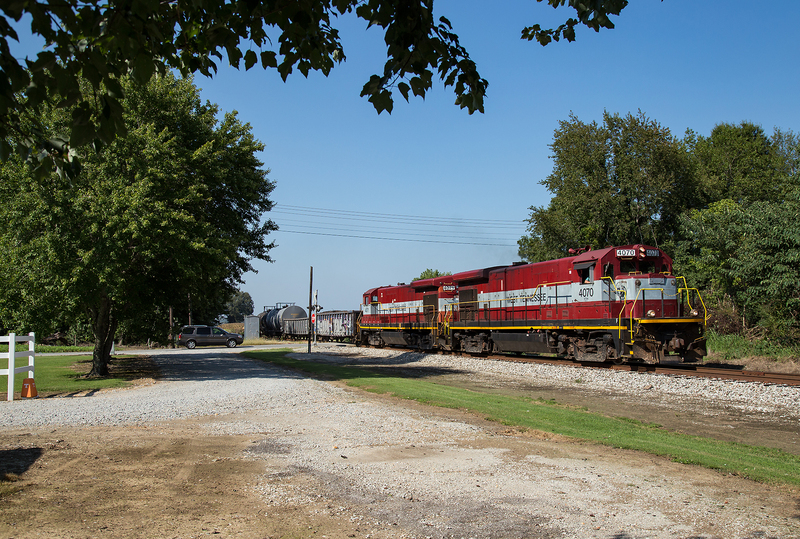 This 169 mile line was built in the mid 1920s to reduce curves and grades on its original mainline through Cairo, IL. 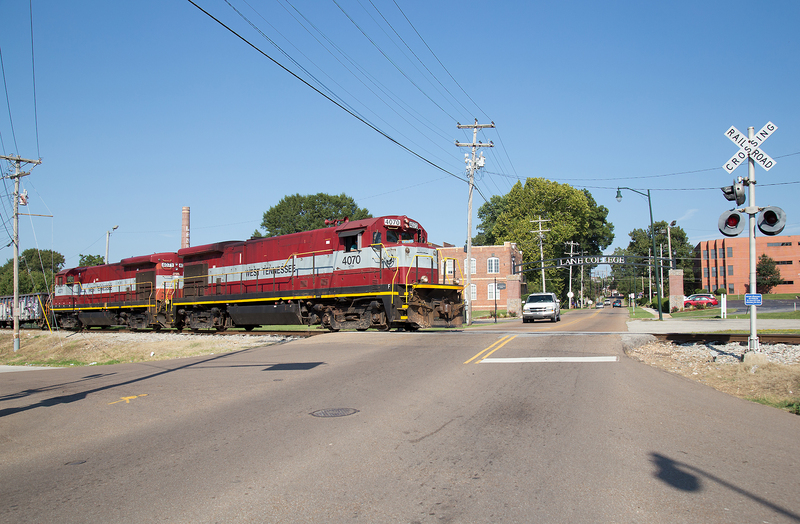 The former IC now WTNN main to Jackon was signaled by NS with ABS signals but the system was turned off when WTNN acquired the line in 2001, curiously this signal was turned to the side and now appears to be guarding the long gone diamond for Paducah bound trains that will never come. The train showed up shortly after I set up but disappointingly with only 4 cars, likely part of the reason for the B23-7’s as the B40-8Ws would have been well overpowered for this train, no matter though it was a cloudless day and the B23-7s were leading southbound! Rolling south through Martin at track speed. Martin is Home to the University of Tennessee Martin and as such is probably one of the more lively towns along the line with a still busy downtown district. Crossing a small wooden trestle north of Sharon, the line has many such small bridges. 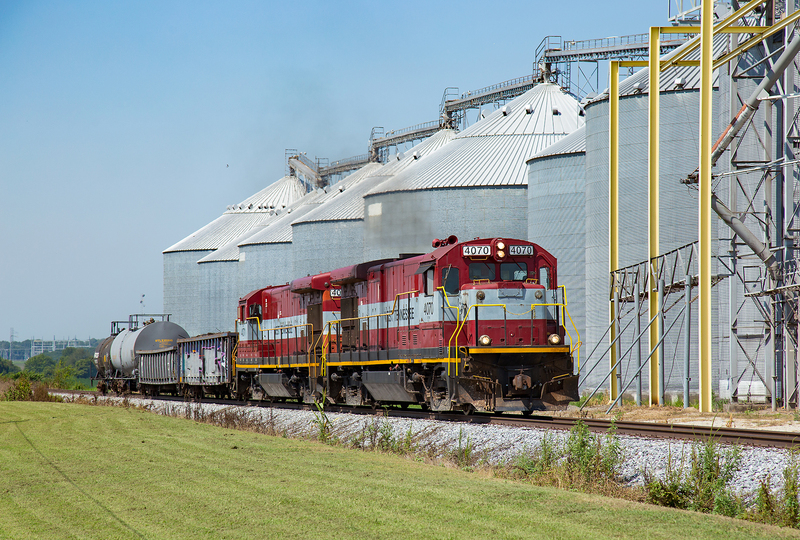 Passing a large feed elevator at Sharon. 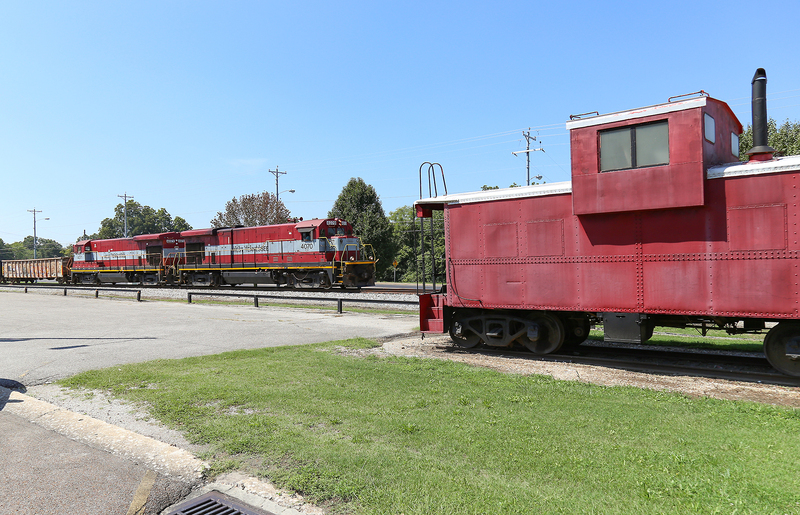 Passing through Greenfield, TN which has an old Alton/GM&O extended vision caboose on display. North of Milan I came across the interesting sight of two old IC heavyweights, last used in MOW service lying derelict outside of a scrapyard. 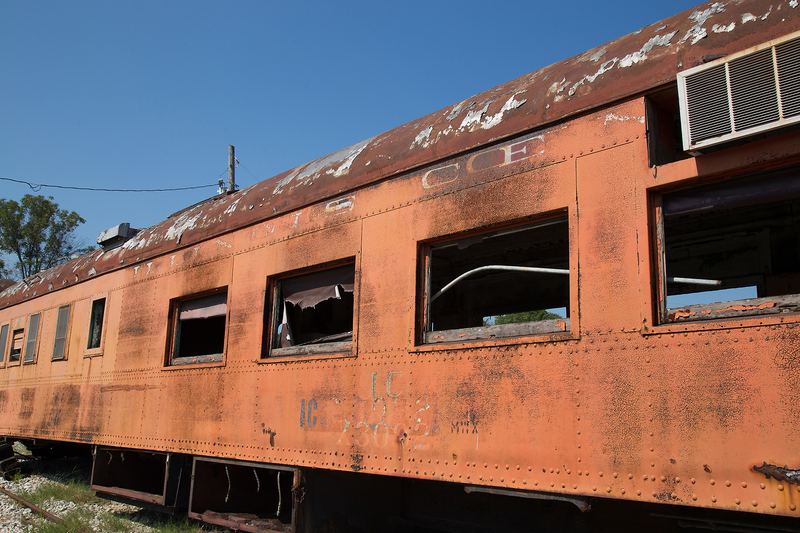 Traces of the old IC chocolate and orange can be seen under the fading orange paint. Crossing the diamond in Milan, the connecting track used by CSX is to the right. Being a big GM&O fan I had to go back to the yards to get some photos of the former GM&O Iselin shops in good sunlight, the facility is now being used by a steel company so I could not get close but the building still tower over the yard. It was nice to see the shop building in person where I have seen so many GM&O era photos. 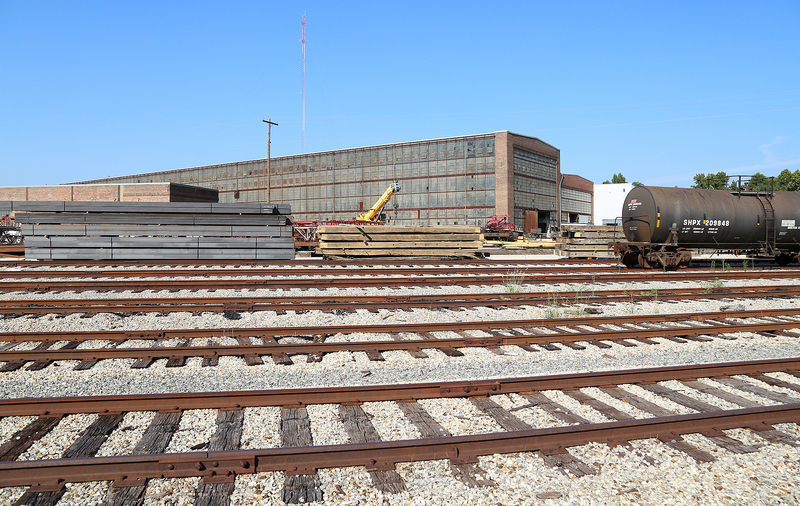 Jackson was once home to 3 railroads, the GM&O, the IC and the NC&STL. Today none of the lines are truly through routes with the WTNN operating the remnants of both the IC and GM&O. Interestingly CSX still runs to town via WTNN trackage rights to serve an isolated portion of the NC&STL Memphis Division, while the majority of the line between Cordova (A Memphis suburb) and Hollow Rock Junction was abandoned shortly after the L&N merger the portion in Jackson still has several large customers and see’s regular CSX service. 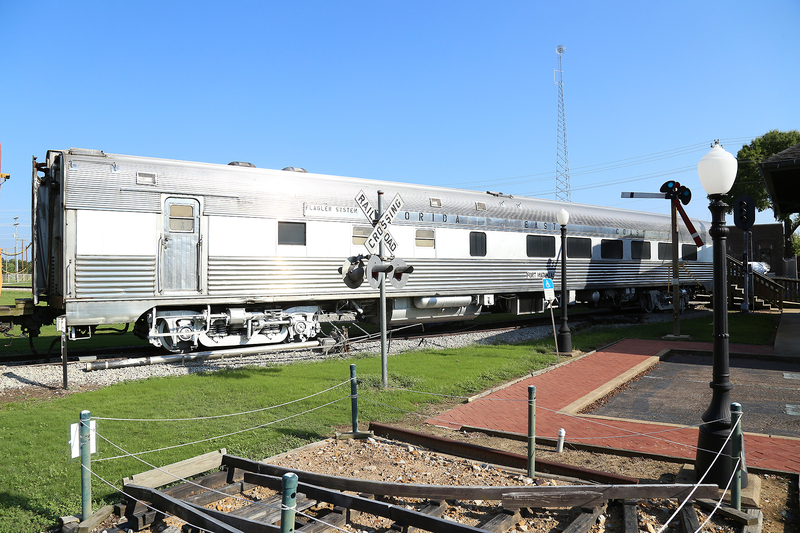 The former NC&STL depot has been turned into a museum which oddly enough features a former Florida East Coast passenger coach. With that it was back to Nashville, with the excitement of the day worn off it was a long and boring drive back. 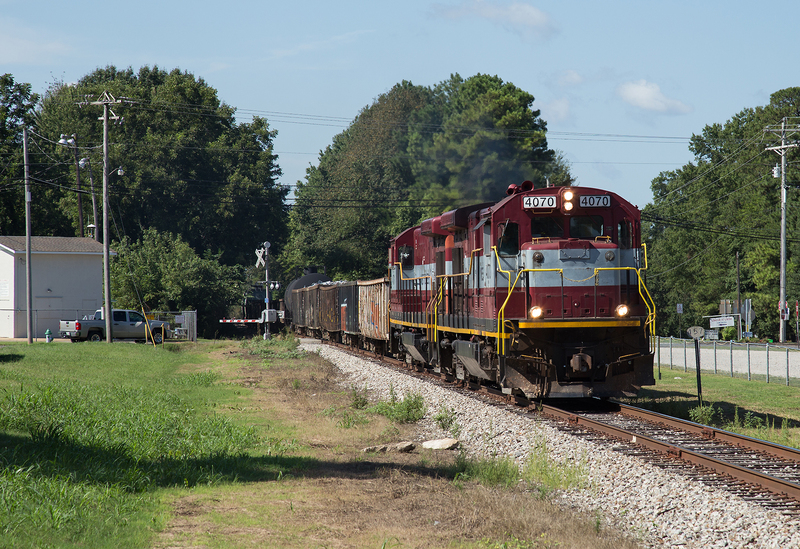 An attempt to find some trains on CSX along route 70 proved to be a waste of time and just added to the long trip. 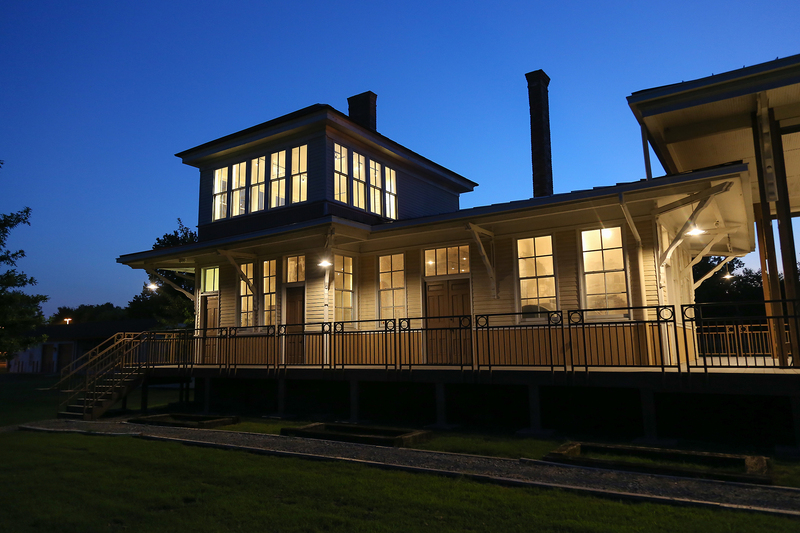 After picking up my friend in Madison at the former depot now restored as Amiqui Junction, it was off for dinner at an nice Indian restaurant in Mount Juliet before some very much needed sleep. For those wanting to visit the WTNN here is a short guide. 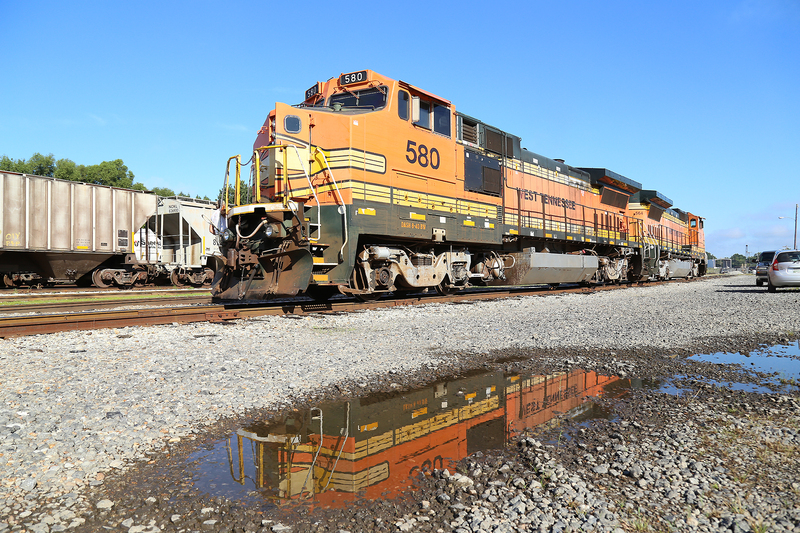 The railroad is primarily a Monday through Friday operation with two regular day jobs. The train crews go on duty around 7AM and usually depart within an hour though sometimes they will be later as was the case on my visit. The first job goes to Humbolt on the former GM&O mainline which now is severed at Kenton where the railroad serves a large grain elevator, the turn will sometimes only run to the CSX interchange at Humbolt but traffic can include unit grain trains from NS which go all the way to Kenton requiring more locomotives. The second job which I chased goes to Fulton and back, this turn often features the less desirable BNSF painted B40-8W’s but is a better chase with more parallel roads and a longer overall run.A special note about the Fulton is that the same unit will usually lead both ways as they back into the yard, so if the B40-8W is leading north it will normally lead back! 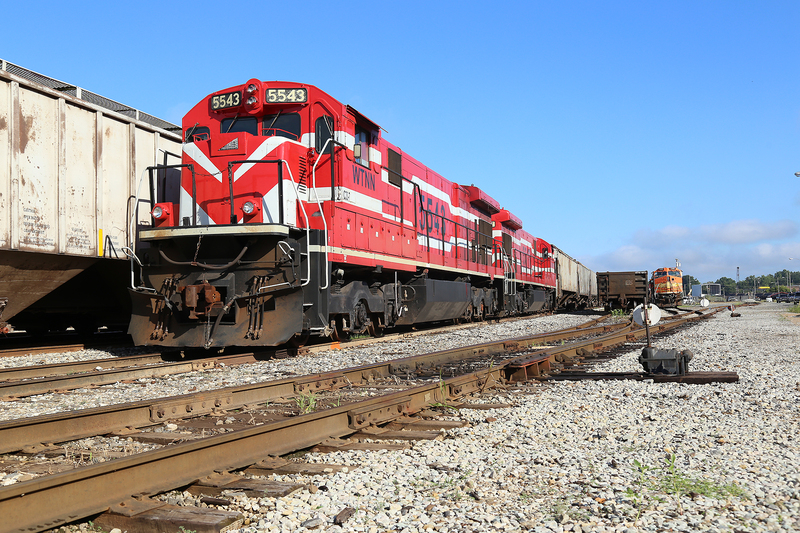 As mentioned WTNN is railfan friendly and you can inquire at the office about train movements, just be sure to be respectful and professional when on railroad property in the yard. The line south of Jackson to Corinth is primarily a night operation though an occasional grain train might make a daylight appearance. Jackson is the best place to start exploring the line, the city is conveniently located off I-40 and there are numerous hotels in the area. 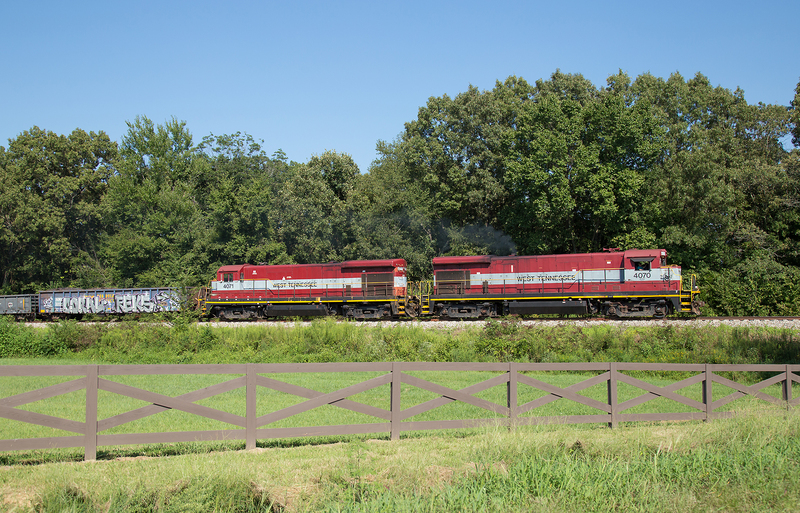 Jackson is about a 2 hour drive from Nashville or Memphis, other shortline railroads in the area include the Tenn-Kenn in Dyersburg which runs with rare former IC GP28’s and the KWT which operates the remnants of the former NC&STL that used to cross at Martin. 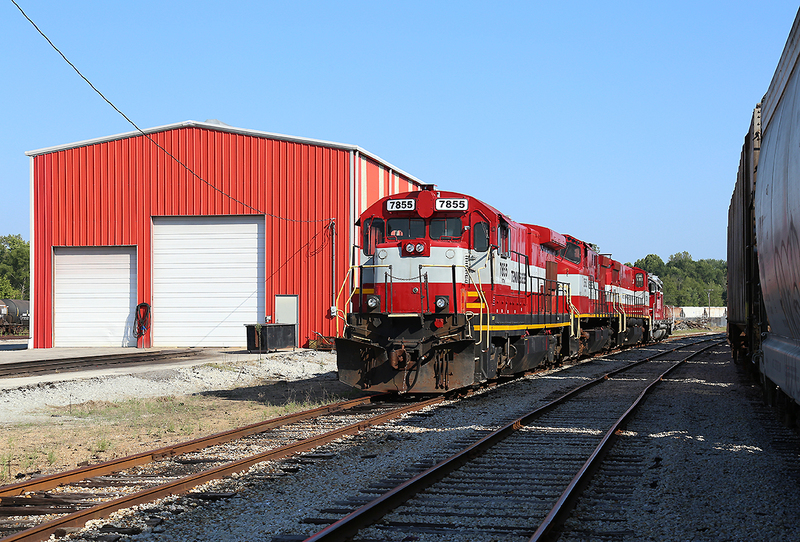 With the number of GE powered shortlines dwindling this railroad is worth a visit! Great write-up Nikos. I am glad to finally be at an actual monitor to read this instead of on my phone. The maps are fantastic. I wish I had done an article / blog entry like this on the ATN when I lived in Alabama. Busy class III’s are great. Thanks for this essay!! Your note about the switching at Ammo reminded me of this place 60 years ago then known as West Junction. There was a small Station and country store at this location. Crews switched the ammunition plant and it was a busy place. My grandparents loved just down the road. Got a cab ride in a steamer there. Thanks Larry! Glad you enjoyed the post and thanks for recounting your experiences here. Did not know that the plant dated back to the steam era! I really enjoyed your article on this line, & the photos as usual were very good!